For Western Wednesday, BAMF Style is taking a look at one of the most classic and unique films in the genre, Butch Cassidy and the Sundance Kid. 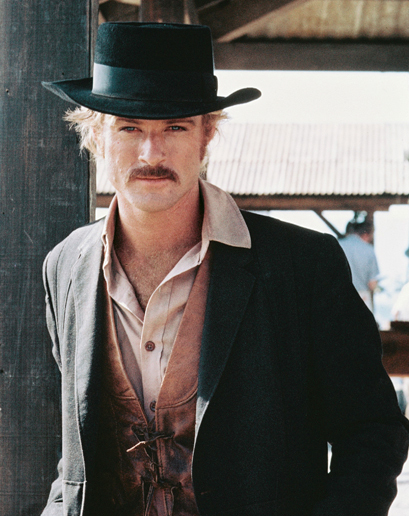 Robert Redford as The Sundance Kid in Butch Cassidy and the Sundance Kid (1969). Last year, we celebrated Robert Redford’s 78th birthday (and Throwback Tuesday, which I’ve decided can be a thing) by breaking down the Sundance Kid’s traveling suit when he and Butch Cassidy pack up and head to Bolivia. This year, for Bob’s 79th, we’ll look at his main outfit leading up to that – a badass assortment of Western wear that epitomize American outlaw style at the turn of the century. 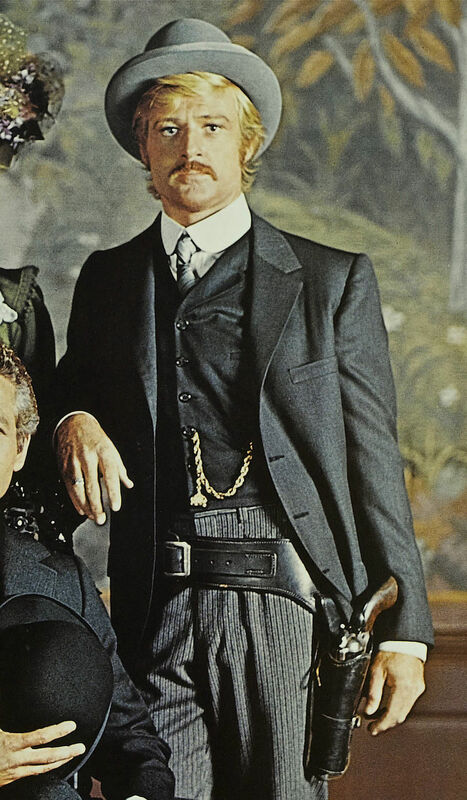 Although the film’s audience would be hard-pressed to call either Butch or Sundance a true villain despite their criminal vocations, Sundance is certainly the darker-demeanored of the two, reflected by his attire. In Bolivia, he wears a black suit and black hat. While still conducting his banditry in the U.S., he wears all black save for a brown corduroy jacket. By default, he becomes the film’s personification of the “black-hatted outlaw” trope although his easy charm differentiates him from more villianous contemporaries like Lee Van Cleef in The Good, the Bad, and the Ugly. 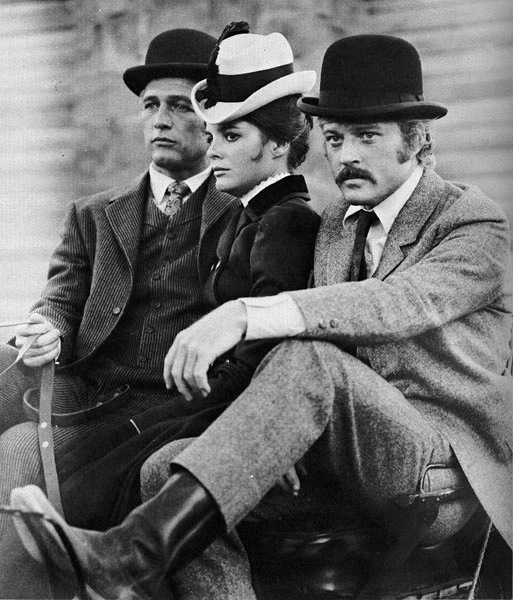 Paul Newman, Katharine Ross, and Robert Redford in Butch Cassidy and the Sundance Kid (1969). For Throwback Tuesday (that’s a thing, right? ), BAMF Style is focusing on another BAMF hero – Robert Redford, who celebrated his 78th birthday yesterday – in the role that arguably shot his career into megastardom. Paul Newman as Butch Cassidy in Butch Cassidy and the Sundance Kid (1969). 105 years ago today, a group of scared and confused law officers surrounded a small boarding house in San Vincente, Bolivia. Inside the house were two tired American men, believed responsible for a score of robberies throughout South America over the past three years. Outside the house stood the police chief, the mayor, city officials, and three soldiers – one of whom was dead. At 2:00 a.m., the officials heard a man screaming from inside the house. A single shot ended the screaming, soon followed by one final gunshot. These were the last shots fired in a daylong gun battle that had raged for nearly 12 hours. Under the light of the morning, the officials cautiously entered the house and found the two men dead, one of a bullet wound in the forehead and the other with a bullet wound in his temple. Robert Redford in Bolivia as “The Sundance Kid” in Butch Cassidy and the Sundance Kid (1969). Butch Cassidy and the Sundance Kid is brilliant. Whether it was Conrad Hall’s alluring photography, George Roy Hill’s groundbreaking direction, William Goldman’s screenplay that ranges from insanely hilarious to poignantly touching, or – most often cited – the perfect chemistry of leads Paul Newman and Robert Redford. The film was a new kind of Western. No longer was John Wayne fighting Injuns with his rifle, kerchief, and ten gallon hat. Tom Mix’s white hat vs. black hat days were over. By 1969, the world had moved on into a place of crystal-clear ambiguity. Cheering for the outlaws was not only acceptable, it was preferred.